Find out if mediator or broker topology is right for you. 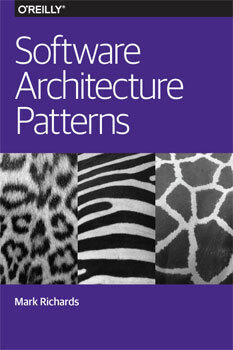 Editor’s note: this is an advance excerpt from Chapter 2 of the forthcoming Software Architecture Patterns by Mark Richards. This report looks at the patterns that define the basic characteristics and behavior of highly scalable and highly agile applications, and will be made available to download in advance of our Software Architecture Conference happening March 16-19 in Boston. The event-driven architecture pattern is a popular distributed asynchronous architecture pattern used to produce highly scalable applications. It is also highly adaptable and can be used for both small and large, complex applications. The pattern is made up of highly decoupled, single-purpose event processing components that asynchronously receive and process events. The mediator topology is useful for events that have multiple steps and require some level of orchestration to process the event. For example, a single event to place a stock trade might require you to first validate the trade, then check the compliance of that stock trade against various rules, assign the trade to a broker, calculate the commission, and finally place the trade with that broker. All of these steps would require some level of orchestration to determine the order of steps and which can be done serially or in parallel. 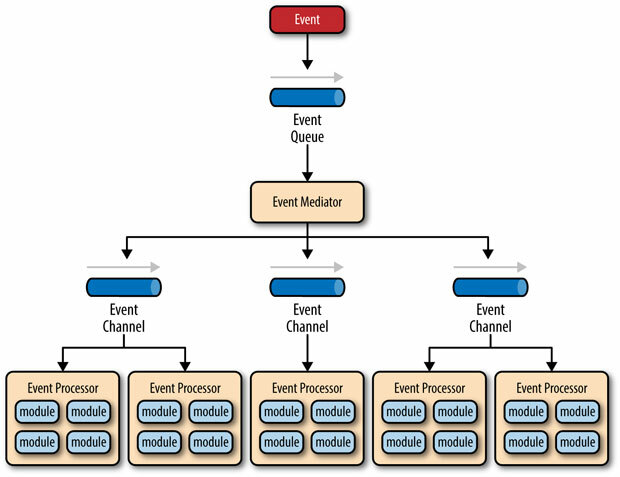 There are four main types of architectural components within the mediator topology: event queues, an event mediator, event channels, and event processors. The event flow starts with a client sending an event to an event queue, which is used to transport the event to the event mediator. The event mediator receives the initial event and orchestrates that event by sending additional asynchronous events to event channels to execute each step of the process. Event processors, which listen on the event channels, receive the event from the event mediator and execute business logic to process the event. Figure 2-1 illustrates the general mediator topology of the event-driven architecture pattern. There are two types of events within this pattern: an initial event and a processing event. The initial event is the original event received by the mediator, whereas the processing events are generated by the mediator and received by the event-processing components. 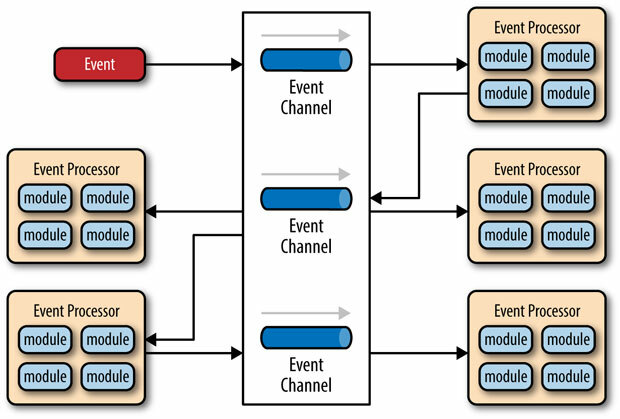 Event channels are used by the event mediator to asynchronously pass processing events related to each step in the initial event to the event processors. The event channels can be either message queues or message topics, although message topics are most widely used with the mediator topology so that processing events can be processed by multiple event processors (each performing a different task based on the processing event received). The event processor components contain the application business logic necessary to process the processing event. Event processors are self-contained, independent, highly decoupled architectural components that perform a specific task in the application or system. While the granularity of the event-processor component can vary from fine-grained (e.g., calculate sales tax on an order) to coarse-grained (e.g., process an insurance claim), it is important to keep in mind that in general, each event-processor component should perform a single business task and not rely on other event processors to complete its specific task. The event mediator can be implemented in a variety of ways. Understand each implementation option to ensure that the solution you choose for the event mediator matches your needs. There are two main types of architectural components within the broker topology: a broker component and an event processor component. The broker component can be centralized or federated and contains all of the event channels that are used within the event flow. The event channels contained within the broker component can be message queues, message topics, or a combination of both. To illustrate how the broker topology works, we’ll use the same example as in the mediator topology (an insured person moves). Since there is no central event mediator to receive the initial event in the broker topology, the customer-process component receives the event directly, changes the customer address, and sends out an event saying it changed a customer’s address (e.g., change address event). 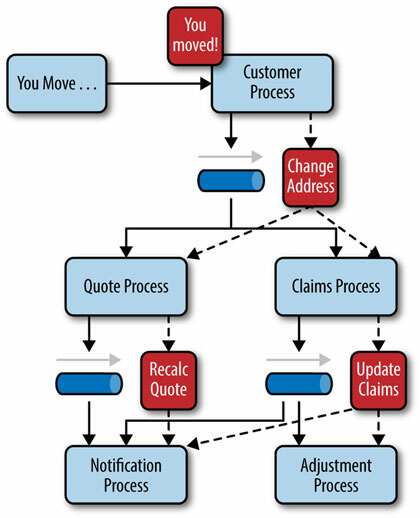 In this example, there are two event processors that are interested in the change address event: the quote process and the claims process. The quote processor component recalculates the new auto-insurance rates based on the address change and publishes an event to the rest of the system indicating what it did (e.g., recalc quote event). 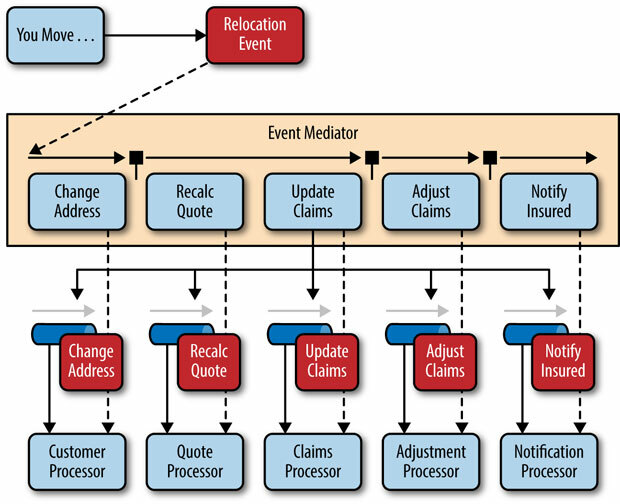 The claims processing component, on the other hand, receives the same change address event, but in this case, it updates an outstanding insurance claim and publishes an event to the system as an update claim event. These new events are then picked up by other event processor components, and the event chain continues through the system until there are no more events published for the initiating event. One consideration to take into account when choosing this pattern is the lack of atomic transactions for a single business process. Because event processor components are highly decoupled and distributed, it is very difficult to maintain a transactional unit of work across them. For this reason, when designing your application using this pattern, you must continuously think about which events can and can’t run independently and plan the granularity of your event processors accordingly. If you find that you need to split a single unit of work across event processors—that is, if you are using separate processors for something that should be an undivided transaction—this is probably not the right pattern for your application.